Last week, I visited a unique camp in Illinois that had typical campers. The kids did archery and arts and crafts; went swimming, fishing, canoeing and horseback riding; played water sports; danced around; sang camp songs; ate tacos and teased the counselors and visitors. 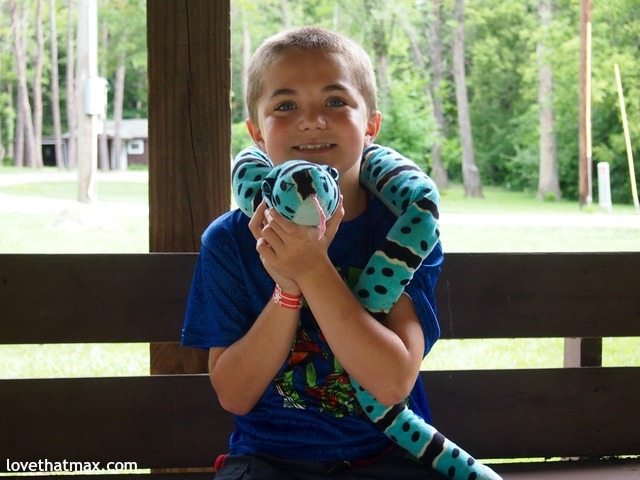 The camp is unique because it's a Muscular Dystrophy Association (MDA) camp in Illinois; all 45 campers have some form of muscular dystrophy or a related disease that takes away physical strength and mobility. 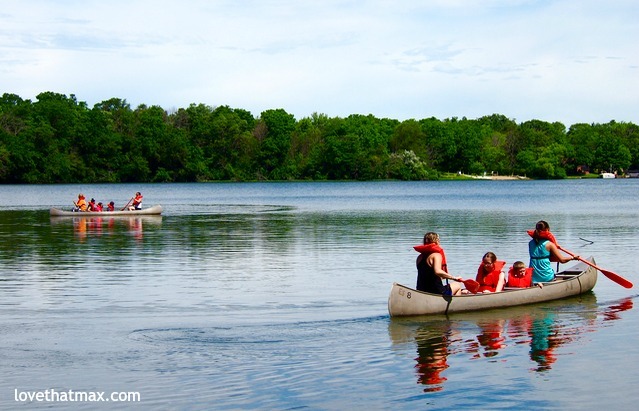 And yet, they seemed like any kids and teens at any camp, enjoying themselves and having a whole lot of fun. Some used wheelchairs, some walked or talked a little slowly, some required use of a ventilator—but they were kids being kids, living it up. 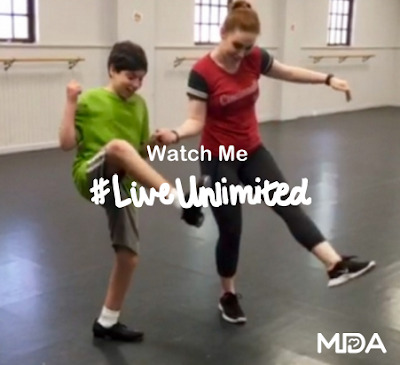 That's exactly the point of Live Unlimited, a six-week campaign recently launched by MDA that encourages us all to get past the "cant's," inspired by MDA families who do that every single day. 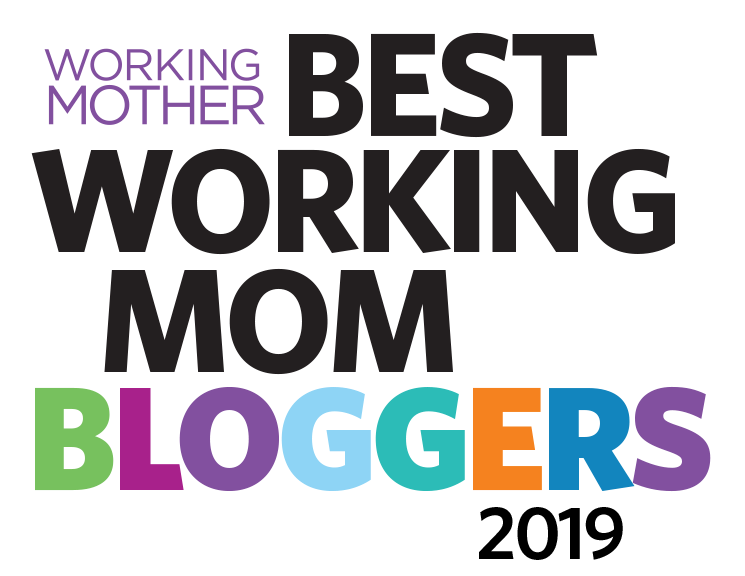 It's what we strive for as parents of kids with special needs. Despite the physical and societal challenges diseases like muscular dystrophy and disorders like cerebral palsy (which Max has) can create, our kids push past their limits and show the world that their disorders do not define them. MDA exists to give individuals and their families strength and independence, with funding going toward research, care, services and support. 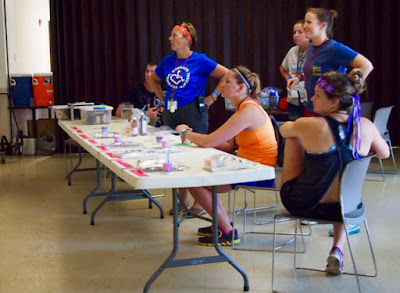 What better way to empower kids than through camp? The non-profit runs close to 75 week-long camps around the country for kids ages 6 to 17. 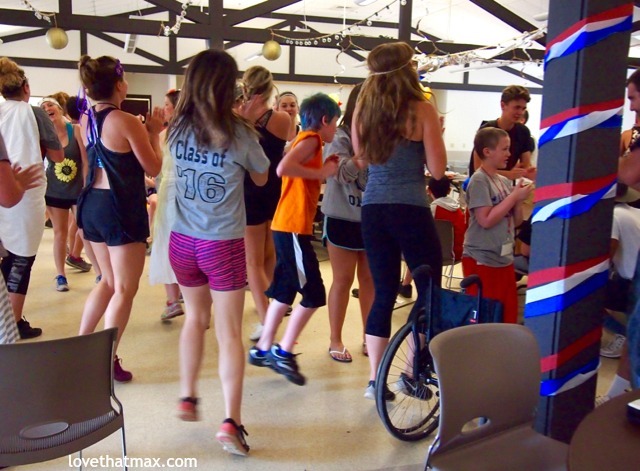 This summer alone it is hosting nearly 4,000 campers, with the goal of giving kids with limited muscle strength and mobility an environment without barriers. 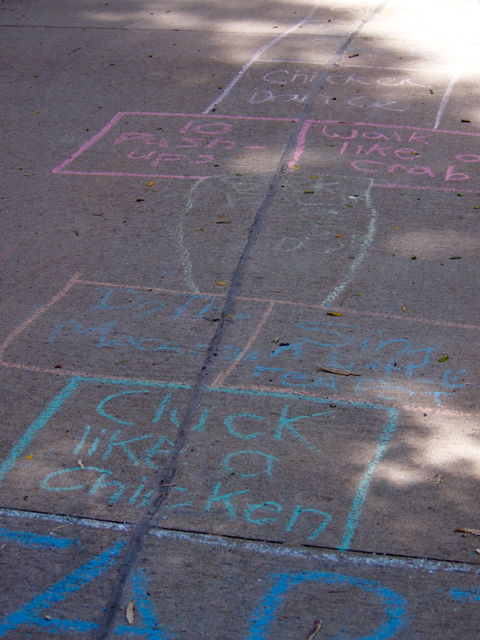 Besides enjoying a wide variety of activities, kids make friends and build self-confidence and independence. 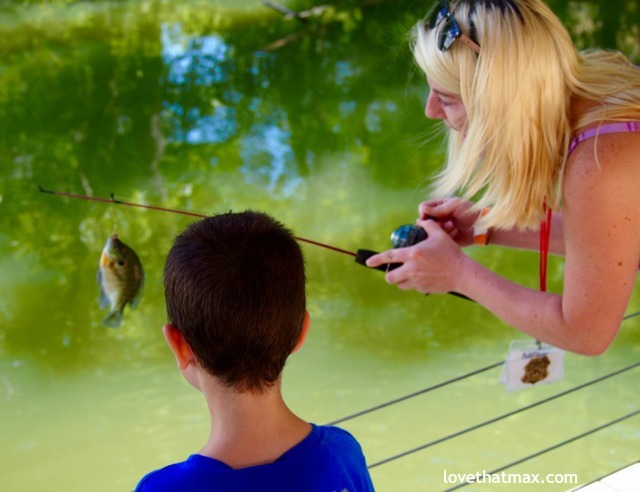 It costs MDA about $2000 to host each camper, but thanks to generous donations, families pay nothing (they can apply through their local MDA office). 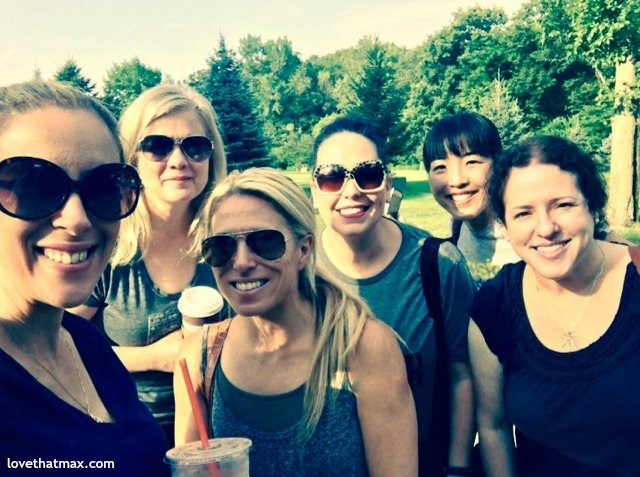 I visited the camp on a blogger trip sponsored by MDA and spearheaded by the awesome and indefatigable Christine Koh of Boston Mamas. I got to hang out with a group of super-cute kids ages 6 to 10, one of whom took great delight in shooting his whirly toy at me. Ya know, like any six-year-old. From left: Vera Sweeney, Wendi Aarons (back), Audrey McLelland (front), Jessica Ashley, Christine Koh and me. Also on our trip: Jen Reeves. The week had an Olympics theme. We arrived on Greek day, hence the toga-and-wreath-wearing counselors we spotted at breakfast. The counselors—all volunteers—include occupational therapists, medical students and students going for a degree in child development. There's also a professional nursing staff on hand. Max has the same kind of foot braces; hers had a cool under-the-sea theme. There are dozens of kinds of neuromuscular diseases, with nine major forms of muscular dystrophy alone. Duchenne muscular dystrophy is the most common one in children, typically caused by a genetic mutation on the mother's side. It usually crops up between ages three and five, mainly affecting boys. I met two different pairs of sibling brothers at camp. During lunchtime, one stopped by our lunch table to give his younger bro a hug. At mealtimes, both counselors and kids fill out "Yes notes" for a job well done. Duchenne muscular dystrophy is progressive; muscles weaken over time. It starts in the hips, pelvic area, thighs and shoulders, then moves on to muscles in the arms, legs and trunk. Children with DMD tend to start using wheelchairs between 7 and 12 years old. Heart and lung muscles are often affected by the early teens. 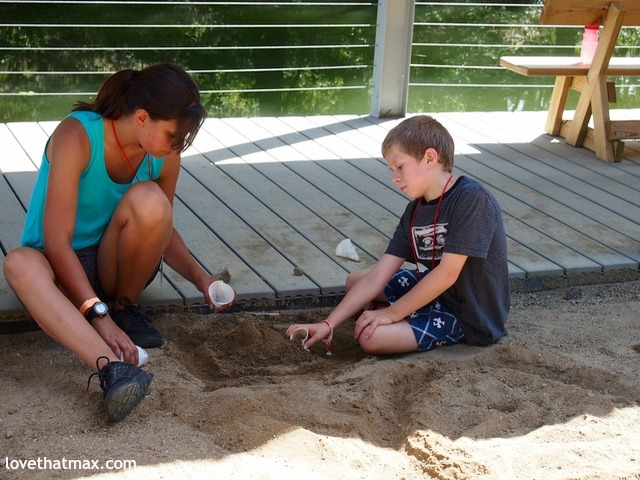 At camp, kids enjoy freedom they don't usually experience at home. 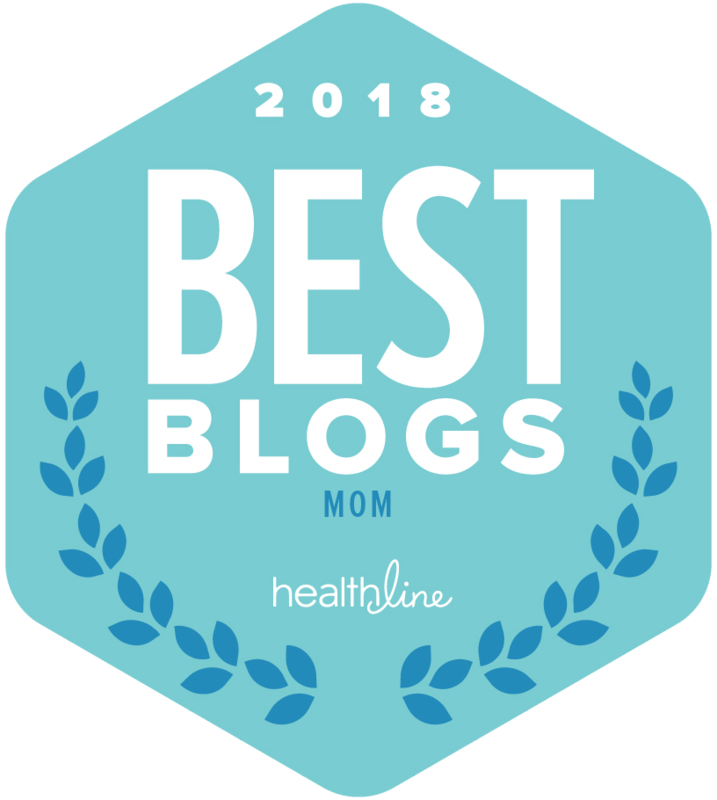 As I know from raising a child with special needs, real life is filled with therapy, treatments and medical appointments. There may be scheduled activities at camp, but everything proceeds at a leisurely pace and the focus is on f-u-n. Meanwhile, parents also get a break. Some children with MD need to be turned over every two hours, so their muscles don't stiffen up overnight. At camp, counselors do the job. The camp is flat and easy to navigate. 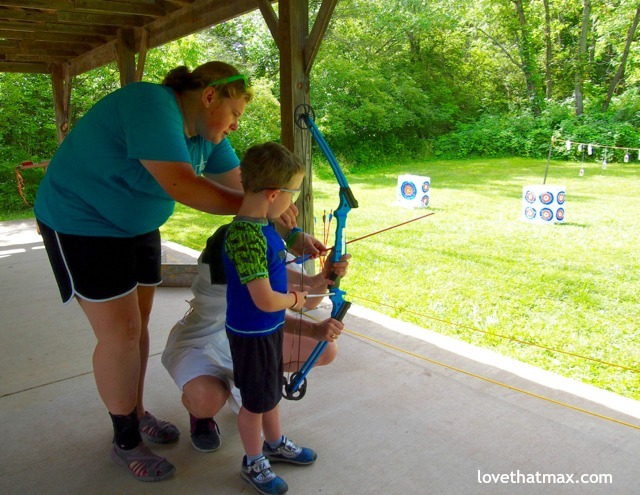 I watched one boy in a power wheelchair gleefully go off the path as we headed to archery, telling his counselor he could handle the grassy terrain no problem (he did). Meanwhile, fellow campers were plotting how to steal counselors' name tags; if that happens, the counselors are forced to do a dance in front of everyone at lunch to get back the tags. Targets unlimited: First he tried the adaptive archery bow. Then he tried the regular bow. Last, he tried a BB gun. Water games unlimited: The entire point seemed to be, get the counselors as wet as possible. 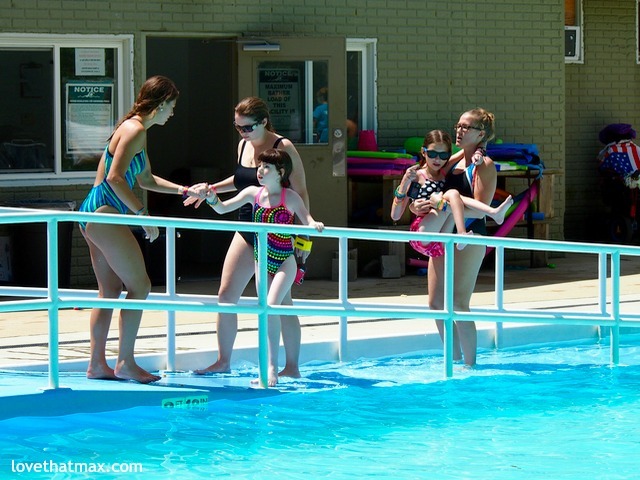 Swimming unlimited: A ramp makes the pool accessible to all. There is a waterproof wheelchair, too. 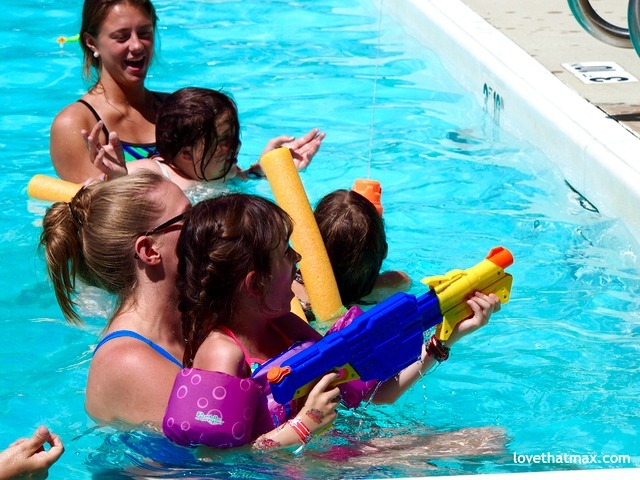 Supersoakers unlimited: The girl spraying water at staffers was fondly known as the camp "firecracker." Blowing bubbles unlimited: It's fun and therapeutic (muscular dystrophy can make breathing difficult). 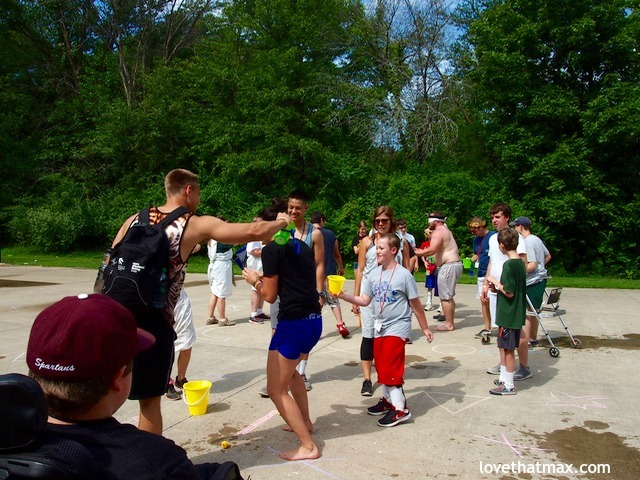 The staff couldn't have been more exuberant, warm and caring toward the kids. During mealtime, counselors sang songs at the top of their lungs, clapped and roared. I asked one boy what his favorite activities were. "Breakfast and the firefighters," he declared. On the first day of camp, kids are welcomed by local firefighters (longtime MDA sponsors through the International Association of Fire Fighters) and their trucks and Harley Davidson (also a longtime MDA sponsor) riders with their bikes. 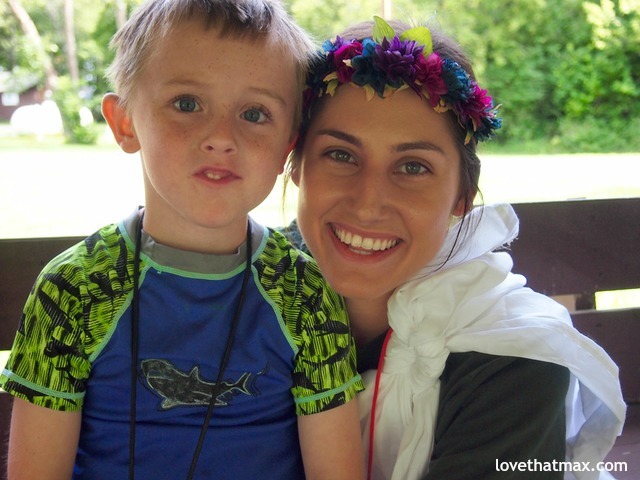 Tori has been a counselor at camp for several years; several members of her family volunteer as well. I also met a woman who's been a counselor for 19 years. Another counselor had once been a camper herself. After lunch, the kids rested in their bunks. Later on in the day, they'd participate in a Lowe's-sponsored activity in which they created floats from styrofoam then raced on them. There was also a night swim. And to be sure, more fun and singing and "Yes notes" at dinner. 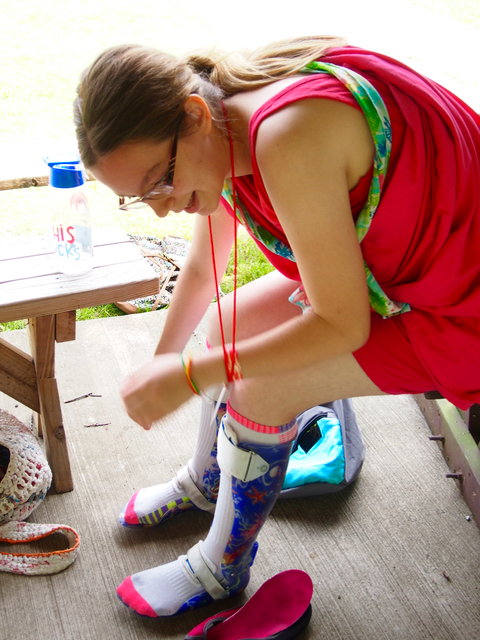 At the start of the day, I'd been talking with a camp staffer about muscular dystrophy. She told me that the average life span of a person with Duchenne muscular dystrophy is 30 years old, although there are cases of men living into their 40s and 50s. 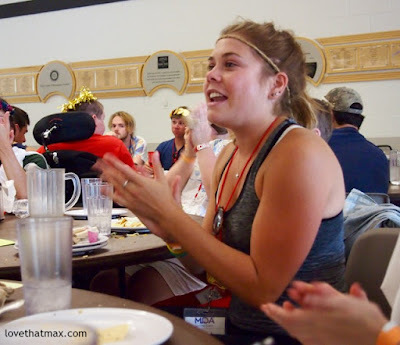 We were in the dining hall when she said that, and as I looked around at the campers' happy faces, I choked up. As the day went on, though, I was continuously reminded what I've learned from raising Max: Kids live and love the life they've got. They don't know any differently. It's our jobs as parents, family, loved ones and Adults Who Care to help them achieve the most boundless existence possible. 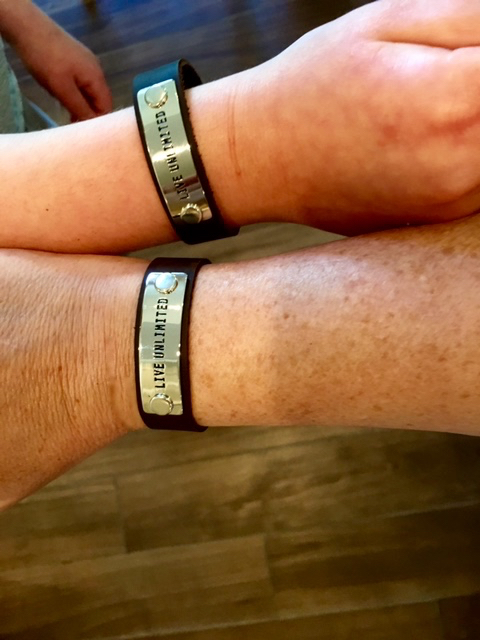 Max and I each received one of these leather Live Unlimited bracelets, from Endorphin Warrior. For every $22 bracelet sold, $6 goes directly to MDA to help kids like the ones I hung out with at camp. Go to MDA #LiveUnlimited to create a #LiveUnlimited image; you can either upload a photo or just choose a background image (it takes about 10 seconds) that shows how you live unlimited. Until July 31, for every image created, sponsors will donate $5 to help kids and adults with muscular dystrophy, up to $30,000. I went with Max's most recent #LiveUnlimited accomplishment: tap dance lessons. Our trip was hosted by the Muscular Dystrophy Association. We definitely live in a post-Telethon world, don't we, Ellen? 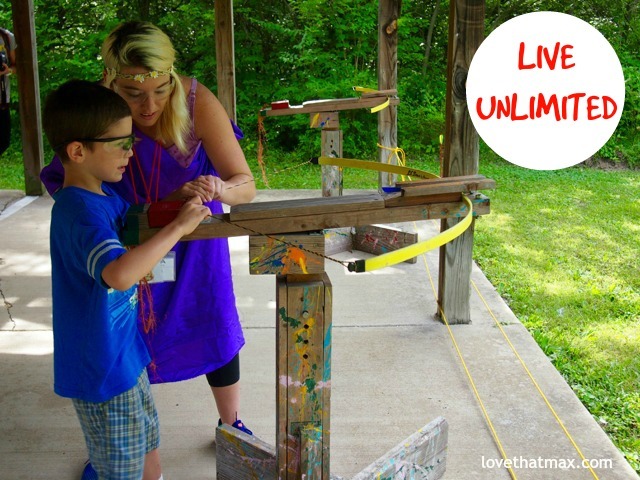 Live Unlimited really says it all - for all of our kids, regardless of abilities. 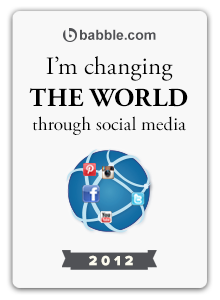 Thanks for going and for sharing. Live life unlimited for sure! The kids all look so happy! The MDA is a great organization, my grandmother had ALS which isn't MD but it is neuromuscular disease and the MDA helps raise awareness and funding for it too. So, so wonderful Ellen. 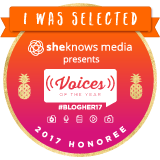 Thank you for being a part of this!!!!! Everyone has their limits, though. I cannot grow any taller or be a soprano.